On May 12, 1993, Walt Disney was posthumously inducted into the Hall of Famous Missourians, located in the Missouri House of Representative. This award honors those from the state of Missouri who have made an impact on the world. Although born in Chicago, Illinois, Disney always considered Missouri, his home; Marceline was where Disney discovered his loves of drawing and trains, and Kansas City’s Electric Park was an inspiration for the look of Disneyland. Disney joins the likes of Scott Joplin, Harry Truman, and Laura Ingalls Wilder. 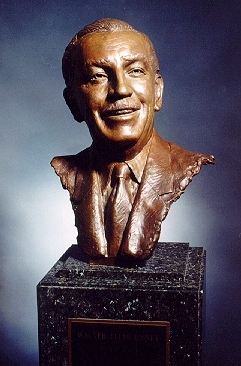 Disney is honored by a bronze bust, sculpted by William J. Williams. Posted in Uncategorized and tagged 1990s, Award, Disney, Walt Disney. Bookmark the permalink.